1. That I have to have it all together. Truth be told, I am a mess. Impatient, judgemental, quick-tempered and unrightouesly stuborn. All things I’m working on. But then there are just the things I am not naturally talented at, like crafting, or making things with my hands. I am not the most eloquent of speakers, or the smartest, and numbers and I are like water and oil. And that’s okay. I’m tired of counting my weakness instead of counting my strengths. Waiting and falling for the notion that until all the pieces of the puzzle of “perfect living” have fallen into place that it’s all a loss. Nope, we DON’T HAVE TO HAVE IT ALL TOGETHER! I don't have to be good at everything, or have a Pinterest perfect life in order to have a good and beautiful one. We get to be our beautiful, messy, selves. A self full of strengths and weakness! 2. That there is one right way to parent. There are a lot of people with opinions out there. To be honest, it’s quite overwhelming to me how many people really think they have the “best” way of doing something. But that’s the thing, what makes your way the bestway? It’s just your best way. That might not always mean it’s the best way for me. Whether the issue is to vaccinate or not, to buy organic or conventional, to homeschool or go the mainstream route, to work or be a stay at home mother; there is always a hot button issue that we each take a side on. No fault there, but please stop telling me your way is the right way, and I will stay clear of the same error. You do you, I’ll do me, and let's just encourage each other to use that nice big organ between our skull as we discern those big parenting decisions! 3. That my child's achievements are tied to my achievements as a parent. My kids are still fairly young, but yet I already feel the pressure of “the achievement society.” Ya know, that whole, “well my kid can do this thing” or "my kid won this award." Most often us moms (maybe dads too) are doing it to show that WE did a good job, that we measure up as a parent. It's not about our kid's success or gifts, its about ours. We want to feel like we won an award at parenting. Vicariously we teach our children to over-achieve, to strive for perfectionism, telling them perhaps that “we want what's best for them.” Maybe that's the truth. But far too often, it's not. Sure, check your own motives, that’s not my place. But I for one am not buying the lie anymore. My message to my kids: do your best, be you, enjoy your life, learn hard lessons and do what makes you happy. I’m not going to be pushing you to fulfill my dreams or earn my parenting star. It’s just not right. 4. That my children have to be priority #1. Okay, this may come as a surprise to some. But let me explain. Do we love our kids? More than words can say. Do we sacrifice for them day in and day out? God only knows. Do we give until it hurts? Umm labor, anyone? Okay, point made. But here's the thing, being a good parent (for me), requires two primary elements. The first is taking care of myself. Making sure I have time for myself and that my needs are being met. I know this sounds like a luxary, but that’s because we are told that our kids' needs come first. Well, tell me, how's that working out for ya? Are you losing your mind, pulling your hair out, running out of energy to play with your children? Well, if like me, most often your answer is yes, maybe the solution is to take some time for yourself. Ever been on an airplane? What do they tell you? "Put your oxygen mask on before putting on the one of your child." Airplane oxygen mask philosophy. 5. That I am always failing. Is it me, or are we constantly hearing the message of “Try harder. Be better. Don’t mess up. Do more.” Those words in themselves are not innately wrong, but the message I hear of “you're not measuring up” certainly is. I’m sure #'s 1 though 4 of the preceding lies all congregate here, but let’s just take a moment to dispel this myth. Failing is not always bad! I know, earth shattering, right? Some of the biggest failures of my life have been the best lessons and the biggest motivators for healthy change. Now failure has a pretty wide continumum, and I’m not talking about the extreme. 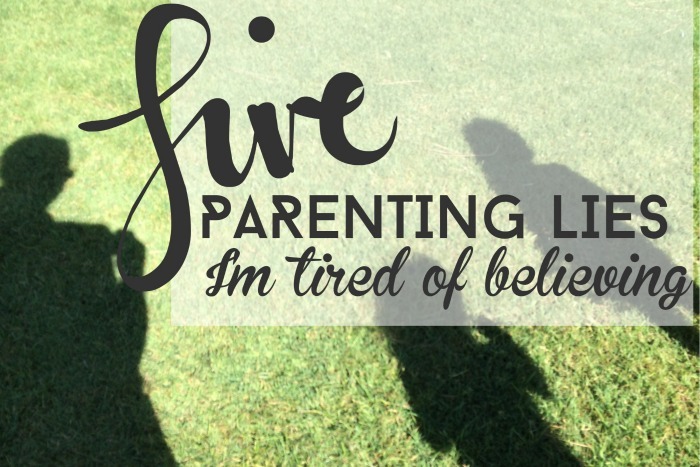 I am talking about the every day, and sometimes not every day lessons that have to be learned in parenting after we have made a mistake. We are so ready to add up the things we "feel short" in throughout the day, but somehow fail to recollect all the moments of triumph or success. Parenting is hard work. Mothering is soul-wrenching. Give it all you've got. And know that that will always be more than enough!